← Autumn: It´s a Game of Three Halves! This webcam has a view over Lake Viñuela, which is a 15 minute drive inland from the coastal town of Torre del Mar, in the heart of the Axarquía region. Situated 285m above sea level, the camera points in a general NNW direction, giving spectacular views across the lake towards the mountains beyond. 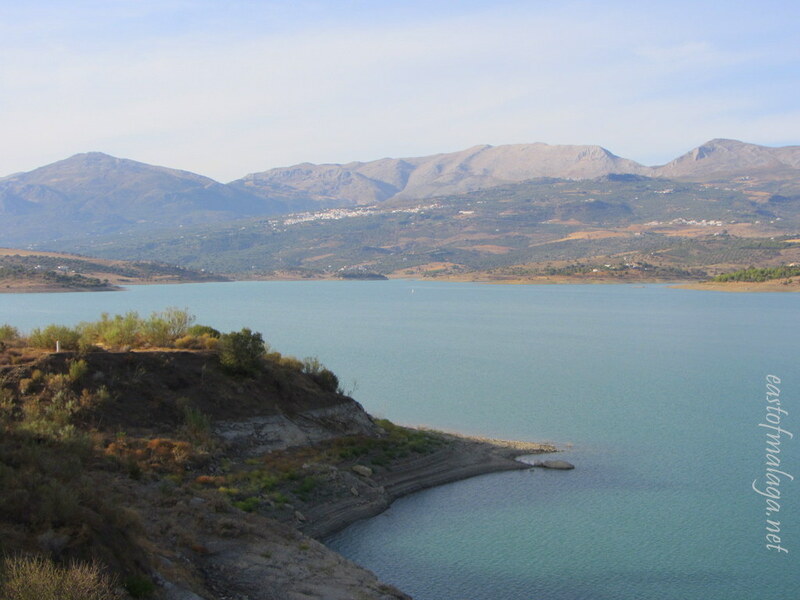 Lake Viñuela takes it’s name from the nearby white village of La Viñuela, close to the point where the Rivers Vélez, Guaro and Seco were dammed to create this spectacular man-made reservoir. The reservoir has a capacity of 170 million cubic metres of water, providing drinking water to thousands of homes in the area. As the lake forms part of the local drinking supply, only non-motorized boats are permitted on the water, adding to the general tranquility of this beautiful region. 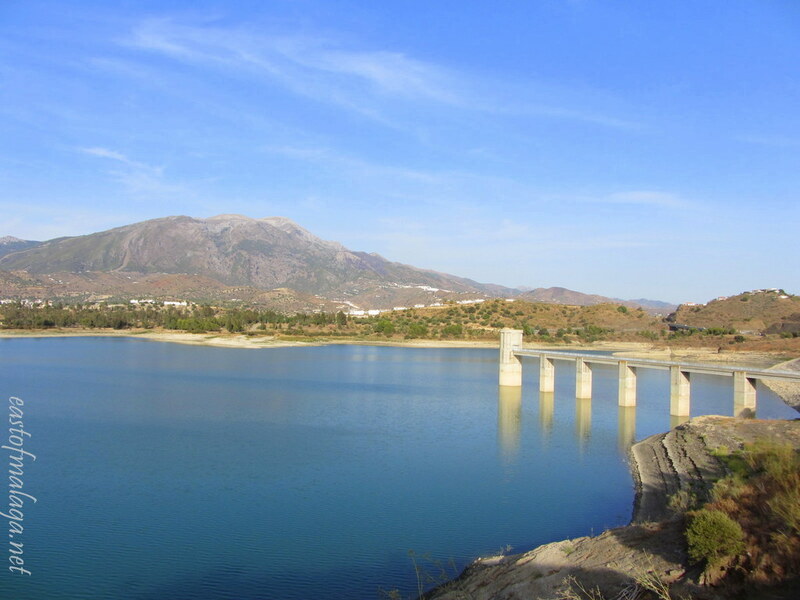 According to embalses.net, La Viñuela reservoir (Embalse de La Viñuela) is currently full to 70 per cent capacity, which is 3 per cent less than this time last year, but 20 per cent more than the average for this time of year. To be honest, when I saw it on Monday afternoon (17th September), it looked lower than that. We have had a particularly hot summer this year, and the impending autumn thunderstorms will bring welcome relief for the parched ground. The normal pattern would be that these first autumn rains arrive anywhere from mid September to early October. Only time will tell. Prior to the creation of the reservoir, extensive archaeological excavations were carried out, producing evidence of Neolithic and Roman settlements, demonstrating the longevity of this area’s historic legacy. It is possible to almost circumnavigate the reservoir by road, and there are several picnic and barbeque areas along the route, all with spectacular views of the lake and mountains. Where does your water come from? Do you rely on town or reservoir water, or do you have an independent supply? This entry was tagged Andalucía, East of Malaga, Europe, Lake Viñuela, Malaga, photography, reservoir, Spain, water levels. Bookmark the permalink. Does anyone have old photographs of the valley before it was flooded to create Lake Vinuela? I’m planning to scuba dive on the flooded village this year and get some photgraphs….thanks. That’s an interesting question, Gary. I’m afraid I don’t have an answer for you – but I’ll make some enquiries. Many thanks Marianne. I need the photgraphs to help me work out where the village actually is. It’s a big old reservoir so I would hate to swim around for days trying to find it. Also I’m still trying to find who I need to deal with to get the permissions to dive (from the beach so I don’t need to use a motorboat / engine on the water) Maybe the local Ayuntamiento? I’m in a group on FB and I posed the question for you yesterday. Some people posted photos and suggested asking in the town hall or library in La Viñuela, which I thought were good ideas. If you’re on FB you could join the group and see the thread. It’s called Axarquia Local Info Group. Other members have also suggested some other local groups on FB that post old photos – which you will see on the thread. If you’re not on FB, you’ll have to let me know and I’ll try to think of another way to get the photos to you. Will take a look on FB Marianne. Many thanks. I’ll be in the area in a couple of weeks, shall speak to the Ayuntamiento. Hi Lee – you’d need to have a word with Gary to find out what he discovered. As you can see from my response to him, I directed him to a FB group covering this area – Axarquia Local Information Group. I have no further information, Lee. Looking forward to seeing it next week when we pop home for a few days! Can´t wait – it will feel like a little holiday! What great pictures. Shows a great photographer’s presence. Our village is full of natural spring water troughs…even walking in the mountains natural springs are everywhere!! I think it’s fantastic to live in an area with a long history. I like to imagine that ancient peoples stood on the very ground I’m standing on when I’m there. Such a beautiful spot and how smart to have included places for picnics in the plans. I hope your area gets the rain it needs in the weeks ahead. There has been so much drought this year and it would be nice to see it all come to an end. I wouldn´t say there has been a drought here, John, as it´s quite normal for there to be very little or no rain from around May until September/October, each year. Our main rainfall comes over the winter months – last winter was drier than usual but the winter before was wetter than normal! Hopefully the rain will come as hoped for, because changing conditions play havoc with the grape, mango and avocado crops. Thanks Dianne. In the towns and villages it´s the same here, but if you live in the countryside (like we do) then it´s a bit different. Our water doesn´t come from this reservoir but from another source. Great images, and very interesting about the evidence of Neolithic and Roman settlements. Topical post for me as well, because the weather bureau is predicting a hot dry summer for us. Good, as we will be on holidays. Bad as Sydney’s Warragamba Dam which is now full again due to recent years rain after many years at dangerously low levels resultng in the construction of a controversial desalination plant as an alternative source. Bad also as our house in the country, where we’ll be spending a great deal of the summer has rain water tanks only. Looks like we’ll be showering at the beach! The weather patterns have been changing over the years throughout the world, haven´t they? Interesting article EllaDee – thanks for linking to it for me. We spent a few months, a couple of years ago, on the east coast of Australia when there were terrible floods. We were staying in Grafton in the Northern Rivers area at the time, and the levy bank (which is over 8 metres above the level of the Clarence River) saved the city by being only a few centimetres higher than the rising waters!! There were very grey skies and rain every day. We have some great reservoirs for walking around in the Algarve too. Will check out the water levels when I’m there next month. After all the fires… what a year! Have you ever visited this part of Spain? We in Victoria rely on a water reservoir too, and it produces really delicious water. But like you, we’ve had a long, hot summer (yay!) and we’re waiting for the rains to replenish the reserves. (And rain, in Victoria, is inevitable – all winter long. Sigh.) Great photos, Marianne! Your climate is quite mild for Canada though, isn´t it? Nice photos – funny timing – we had just driven to Competa for the first time yesterday and were going to carry on through to check Lake Viñuela out but ran out of time / steam. Looks very pretty though – perhaps another day. Ooh pretty. Our supply is from a damn here somewhere .. back in Namibia it was also from a dam. Problem was, bodies kept popping up left right and center, some with concrete boots (when the level was really low) others were just floaters. Kind of puts you off tap water, eh? OH dear! Well, I haven´t heard of that happening here, but it certainly would put me off the tap water, yes!